I’m a big fan of software that extends the capabilities of Mac OS X and the Finder. Application Wizard is one such program, though it does so much, it’s difficult to succinctly describe. In its most basic use, Application Wizard--which operates as an OS X System Preferences pane--displays four colored buttons on a small panel you can drag to any position along any screen edge; you can even set the panel to slide out when needed, much like the Dock’s auto-hide mode. The first three buttons in the panel display menus for opening, quitting, and switching applications, respectively. The fourth button displays a menu that lets you navigate your hard drives; display contacts from Address Book or photos from iPhoto (or Aperture); display system memory usage and uptime; and perform a number of other tasks. If you prefer, you can disable any of these buttons, leaving just those that you use regularly. You can customize the Open menu and the fourth (special) menu; for example, you can add folders to or remove folders from the Open menu, and you can customize how preview images are displayed in the special menu. If that was everything Application Wizard offered, it would still be a decent OS X add-on. But there’s much, much more you can do with this app. First, if you don’t like sacrificing screen real estate to the button panel, you can instead display its buttons in the menu bar or (my personal favorite) have them activate as pop-up menus that appear under the cursor whenever you press configurable global hot keys. You can also create application groups, which are collections of programs that you can then launch, show, hide, and quit together via Application Wizard. There’s a ready-to-use group named Excluded Applications; any programs you add to this group won’t be affected when you use the Quit Others or Quit All commands in the Quit menu. You can choose how each program launches using Application Wizard: normally with other programs showing, in the background, hidden, or normally with other programs hidden. You can also choose whether or not a program hides when you use the Hide Others command. I set up iChat, for example, to not hide when I hide others, so that my colleagues can reach me immediately. You can even force an application to open using Rosetta if you want to. One of my favorite features in Application Wizard is the Switching menu. By default, this menu behaves like OS X’s Command-Tab switcher, except it uses a more space-efficient vertical display. However, using Application Wizard’s Menus tab, you can instead have this display include each program’s windows, as well as list the active program’s windows first. I’ve enabled both of these options and assigned this menu to appear when I press Control-Tab. Now I can quickly switch to any window in any program by pressing this shortcut and then scrolling through the hierarchical pop-up menu that appears. There’s much more in Application Wizard, including a single-application mode that automatically does a “hide others” when you switch from one program to another. One drawback to the program is that with this much power, the interface is a bit complex; however, Application Wizard includes very good help, so it’s not too difficult to figure out. The switcher in Application Wizard can not only switch between programs but between open windows of programs. 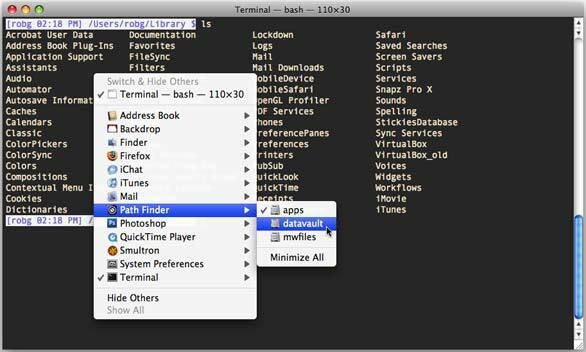 Path Finder is about to become the active application, with the datavault window as the active window. If you find yourself wishing the Finder had a little more power for working with applications, Application Wizard may be just what you need.